A train waits at the Downtown Santa Monica platform while guests explore. Photos by Jason Islas. 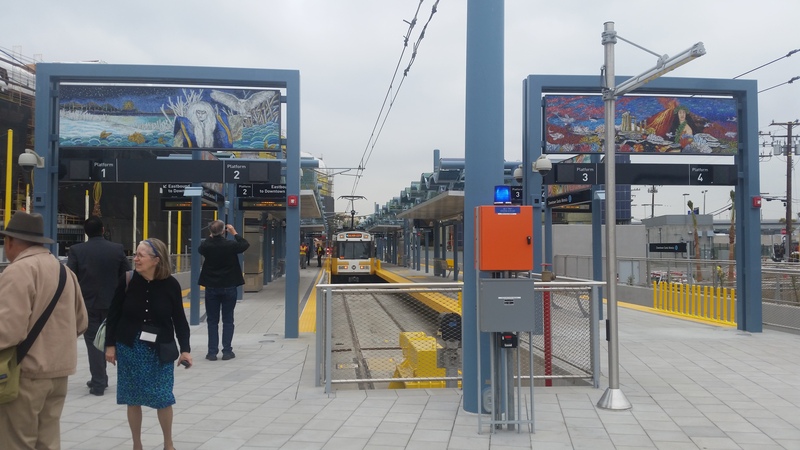 The countdown has begun for the opening of Expo Phase 2 with just over a week left before the 6.6 mile extension of the Expo line opens to the public. 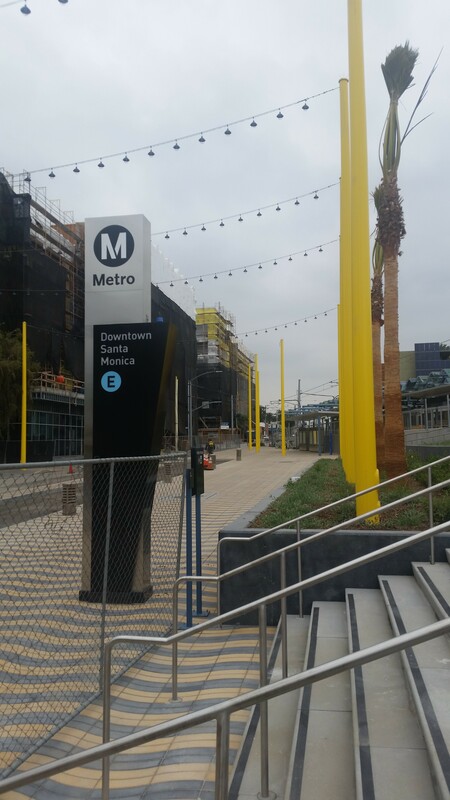 Starting on Monday, various members of the media, public officials, and municipal employees, community groups, and other stakeholders began getting sneak peak rides from the Culver City station — the current terminus of the Expo line — to Downtown Santa Monica, the new end of the line starting on May 20. We were lucky enough to get to ride along yesterday morning and experience the future of Westside public transit. We were joined by Santa Monica City Councilmember Pam O’Connor, who represented Santa Monica and the South Bay on the Metro Board from 2001 to 2015. 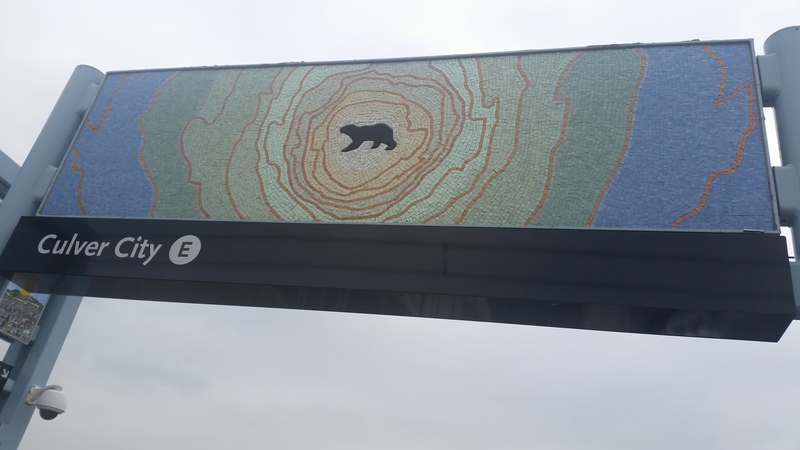 Our trip begin at the Culver City station, the Expo line’s current terminus. It was in her first year on the board that the alignment for the Expo line was decided; that year, O’Connor made the motion that assured the Expo line would come to Santa Monica. That story is retold in a book about the history of modern rail in Los Angeles County, Railtown: The Fight for the Los Angeles Metro Rail and the Future of the City by Ethan Elkind. While the train stopped at all of the seven new stations, riders weren’t allowed to disembark until we arrived at the end of the line. 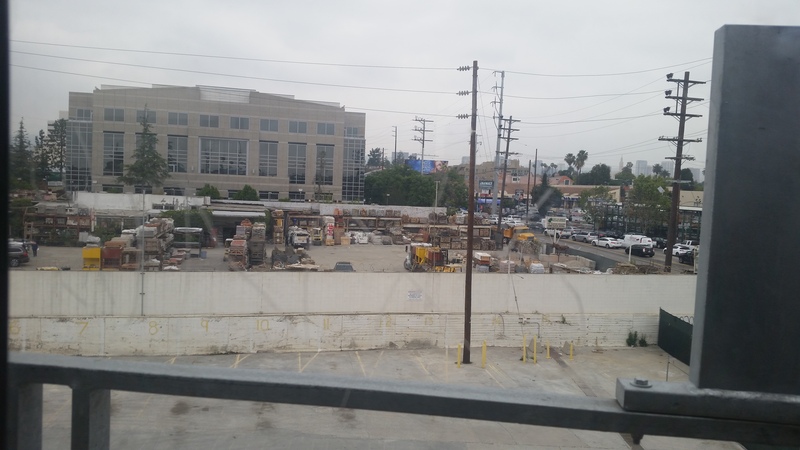 This is the view from inside the train at the Sepulveda station, looking northward toward the Sepulveda/Pico intersection. It helped that O’Connor and Metro actions enjoyed support from ongoing community activism for Expo. Here is the view from the Bundy station, looking north toward the Bundy/Olympic intersection. Now, 15 years later, that “vision and intent” to bring Expo to the sea in Santa Monica will soon be a reality. To celebrate, Metro will be offering free rides on the Expo line starting at noon on May 20 and continuing all day on May 21 (more info here). The view from Bergamot Station (Olympic/26th Street), looking north toward Olympic. Across the street, work on rehabbing the old Papermate factory into office space continues. On Saturday, May 21, the Big Blue Bus and Breeze Bike Share will be offering free rides, too, so people can really try out the multi-modal experience. 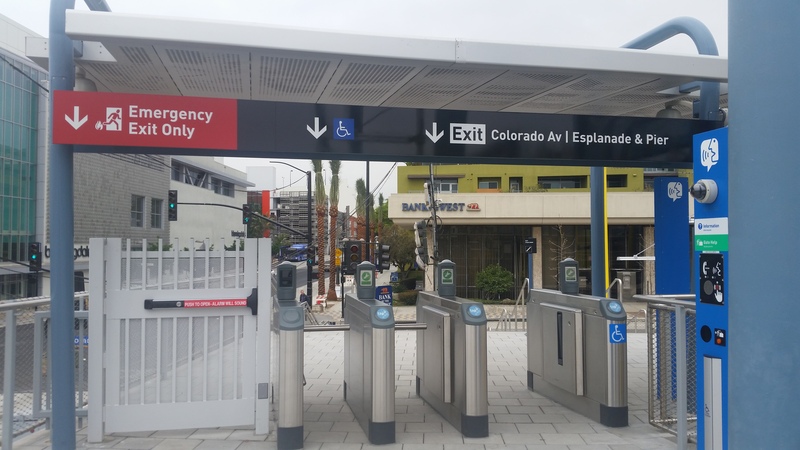 The Downtown Santa Monica station at Colorado and 4th Street connects with the new pedestrian and bike-friendly Colorado Esplanade at street level. Once finished, the Esplanade will provide wide sidewalks and a protected two-way cycle track that will connect people walking and biking from the station to the Santa Monica Pier and surrounding destinations, like Tongva Park, the Promenade, and Ocean Avenue. 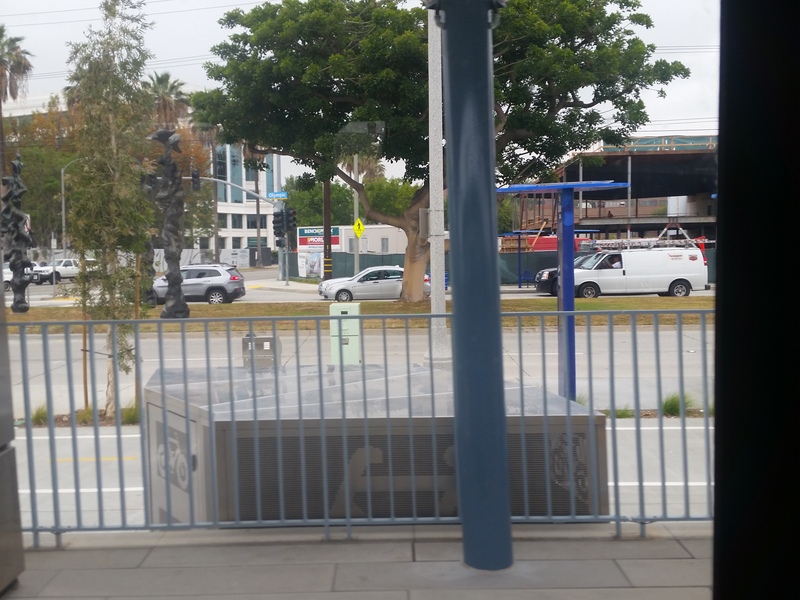 There will also be station parties at five of the seven new stations along the phase 2 extension: Downtown Santa Monica, 17th St/SMC, 26th St/Bergamot, Expo/Bundy and Palms. Culver City station will also have a party, though it has been open since 2012. 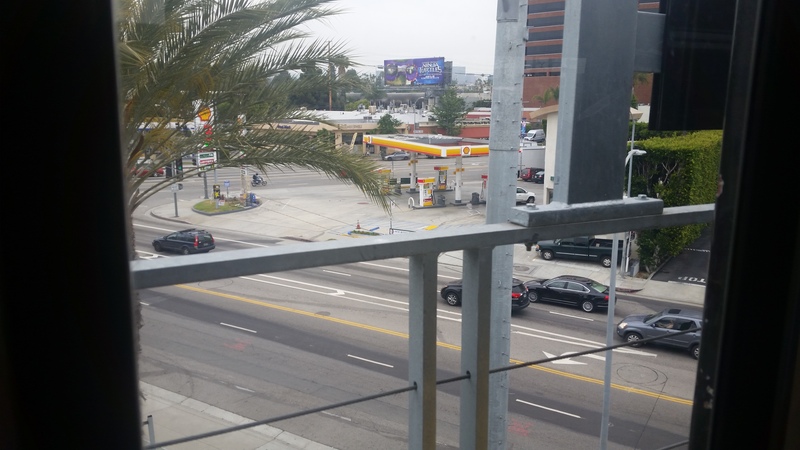 Looking toward the ocean from the western edge of the downtown Santa Monica station. Signage helps passengers get their bearings once they disembark in downtown Santa Monica. 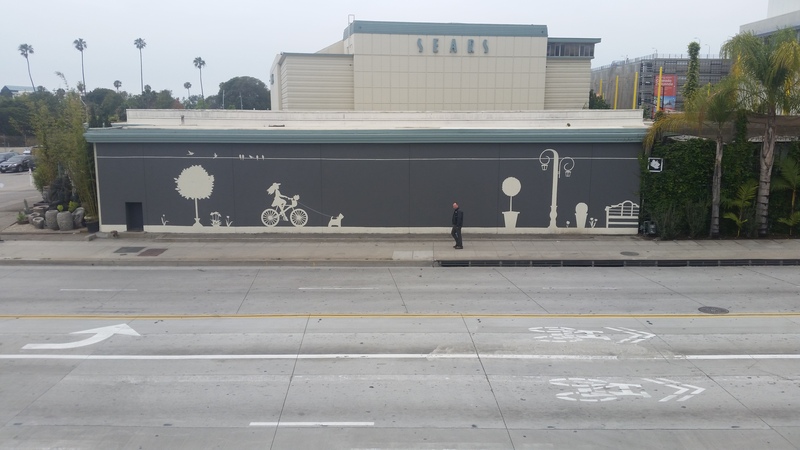 The caption reads “Once finished…” in regards to the Esplanade in Santa Monica. Is that meant to suggest that the Esplanade won’t be completed come opening day? Were there any of those damn cyclists on the train? I’m thinking the people on the train were the movers and shakers of LA. So everyone arrived in private single occupancy 4 wheeled cages, yes? I hear that Metro is offering a free vehicle dismantling program. Make an illegal turn in front of a train on Colorado in Santa Monica and receive free dismantling service. Safety not guaranteed. Yes, it was so successful that they were doing the same around 23rd Street Station today as well. It’s a very popular program. Hardly a week goes by where someone doesn’t take advantage of it. I was under the impression that Metro didn’t have the rolling stock to spare but I guess they do!